Aluminum Sheet 7075 O-Tempered Bare provides superior workability with reduced hardness and increased ductility. Rather than breaking or cracking, highly ductile materials such as annealed aluminum can be elongated or drawn into wire without breaking. 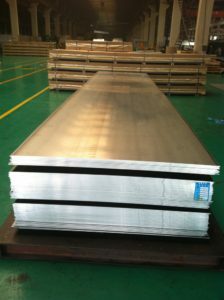 Aluminum 7075-O Sheet / Plate is one of the highest strength aluminum alloys available. Its strength-to-weight ratio is excellent, and is ideally used for highly stressed parts. It can be formed in the annealed condition and subsequently heat treated. Aluminum 7075 is comparatively tough for an aluminum alloy. As such, it produces greater springback during forming operations. If forming difficulty is encountered in the annealed condition, then warming the material to 200°-250°F will assist formability. Aluminum 7075 alloy is capable of high-strength as developed by heat treating. It also has excellent properties at low temperatures. Its electrical conductivity is 36% of copper.